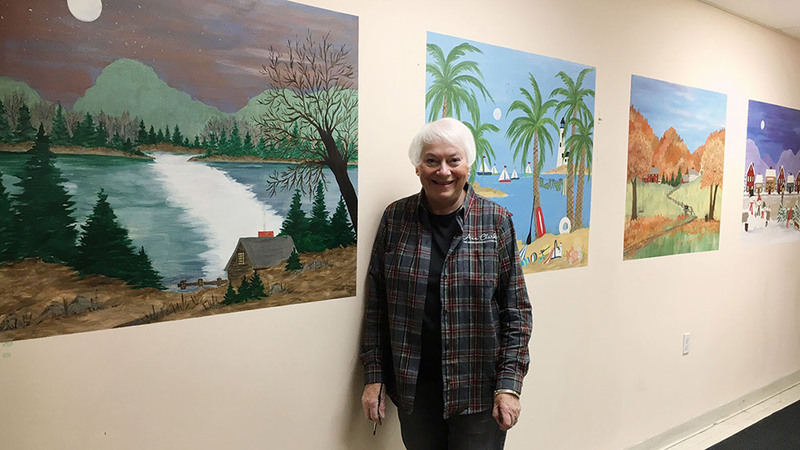 Ann grew up in College Park, Maryland and learned to paint with her best friend Mary Downing Hahn, who later became a well known children's author. Ann studied art at the University of Maryland where she met her husband and company co-founder John Clark. They moved to Vermont to start a family. Ann continued to paint and create artwork for numerous small companies around the state. In 1990 she and John started Ann Clark Cookie Cutters. Today Ann enjoys painting, baking, traveling and spending time with her three grandchildren. Ann with her Four Seasons mural that adorns the wall of the break room at Ann Clark Cookie Cutters. Mary wrote the following about her childhood with Ann. Visit Mary’s biography at http://www.childrensbookguild.org/mary-downing-hahn. Impossible as it may sound, Ann and I have been friends since before we were born. Our mothers both taught at College Park Elementary School, beginning when they were very young, and knew each other during their pregnancies with Ann and me. I was first out -- December 1937. Ann followed in January 1939. Although our mothers visited each other often, Ann and I weren't inseparable until my parents moved into the house next door to Ann. I was six and Ann was five, first graders in Mrs. Schindler's class. We soon discovered we both loved to draw and read, play dolls and paper dolls, explore the creek, the woods, and other forbidden places, climb trees, roller skate and sled ride down College Park's steepest hills, build tree houses, and get into mischief of one kind and another. By today's standards, Ann and I had a great deal of freedom -- hours of unsupervised play with only one rule: be home when the street lights come on or in time for dinner, whichever happened first. Well, actually there were a few other rules -- don’t cross the train tracks, don’t play in the creek, don’t climb trees, don’t ride two on a bike, don’t go to lonely places. Ann and I had a tendency to ignore rules we thought ruined the fun of summer vacation. Unfortunately for us, even though our mothers had taken time off from teaching to raise their families, most people in College Park knew them -- and their children. As a result, our mothers received many phone calls from their network of spies. We’d been seen wading in the creek, a likely source of the polio, the plague of our childhood. We’d been seen flattening pennies on the train tracks, a dangerous pastime which could result in a fate even worse than polio. We’d been seen at the top of a pine tree on the other side of College Park, a sure way to break our bones or fracture our skulls. We’d been seen roller skating down Amherst Road, scooting across the trolley tracks just in front of a trolley, certain death. These activities usually resulted in our being confined to our yards or bedrooms. If we were allowed outside, we could talk across the hedge between our yards. If we had to stay indoors, we could talk to each from our bedroom windows on tin can telephones. When we behaved ourselves, we played games of softball with the four other girls on our block of Guilford Road. Just the six of us, plus a few brothers and tagalongs. No Little League coach telling us what to do and enforcing rules. Of course, we often quarreled over rules and sometimes got so angry we went home in a huff, vowing never to play with the other girls again. Our mother sometimes had difficulty remembering whom we were friends with. We spent long summer days playing Mother may I, red rover, spud, and statues. Our favorite was cowboys. We galloped pretend horses up and down Guilford Road, shouting Hi Ho Silver, and shooting each other with cap pistols (not PC today). When someone was killed, she had to lie down and count to 100 before she could be alive again. One of our friends counted by twos until we figured it out and told her we weren’t playing with her any more. Ann remembers quarreling with me over who got to be the cowboy named Mike. It was our favorite name. Once we discovered Nancy Drew books, we formed a detective club; sure we’d solve mysteries and become famous over night. We followed strangers, spied on certain houses that looked suspicious, and copied the license plate numbers of cars parked at those houses. The man on the corner was without a doubt a Russian spy because he had an accent. The people who lived in a little yellow house at the end of a dirt road were counterfeiters. The woman who took in foster children was actually a kidnapper holding them for ransom. Sadly, we never got the proof we needed to alert the authorities. Summer nights were reserved for Kick the Can and a game based on the popular radio show Truth or Consequences. Being the brain of the bunch, the girl across the street would line us on the front steps and ask us questions. If we gave the wrong answers, she assigned consequences. These almost always involved Mr. B. a cranky man who lived across the street and, we believed, hated children. The unlucky player had to run up his sidewalk, ring the bell, and run. Or, even worse, she had to run around his house, shouting, Mr. B. stinks! The game ended the night Mr. B. popped out from behind a bush and chased me around his house. I don’t know what he intended to do, but I ran faster than he did and thus escaped a terrible fate. Those hours of reading, drawing, painting, putting on plays and circuses, building tree houses, and roaming the creek and the woods contributed to Ann’s and my creativity. The memories we share has preserved our friendship from children to teenagers to college students, to young wives and mothers, through losses and pain, culminating in the joy of reaching our 70’s with our minds actively producing art and crafts and books. Ann and I remember the young people we used to be -- and still are!